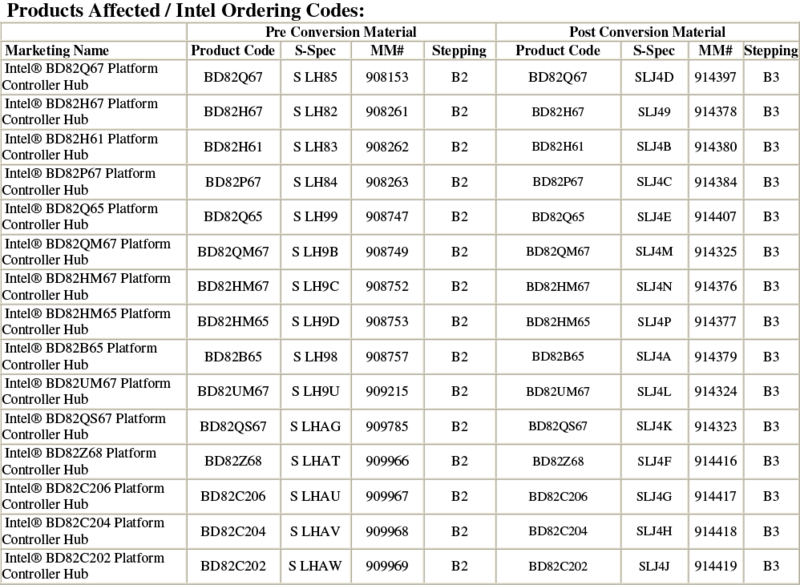 The last day of January Intel has announced for 6 series chipset, codename Cougar Point, to have design error. Shortly after all shipments of 6 series chipset has been suspended while already released products recalled or fell under replacement programs. This has caused enormous repercussions during Chinese New Year, when major motherboard manufacturers and notebook manufacturers have announced their own product recall/replacement program. Intel replied to modify all the 6 series chipset product design, revision upgrade from B2 to B3, and start shipping them in February, with return to normal production output by April. The design flaw in the 6 series chipsets has applied to SATA 3Gbps interface only, while SATA 6Gbps interface has not been affected. Therefore, earlier this week, Intel announced to restore shipment of faulty 6 series chipset for products that use SATA 6Gbps interface only (for example, laptops) to restore supply 6 series chipsets. The revised version of the chipset has said to be already put into production and will start shipping this month. The news has been officially confirmed today, when Intel announced the B3 Stepping 6 series chipsets will start shipping on Monday, 14th of February, a.k.a Valentine’s Day. The B3 revision chipset upgrade includes desktop, mobile platforms — 6 series chipsets, and servers, workstation platform — C200 series chipsets, with full list of model as follows: B65, C202, C204, C206, H61, H67, HM67, HM65, P67, Q65, Q67, QM67, QS67, UM67 and Z68!